This post, dear friend, is for you. But for this job, I am using loppers and a hand pruning saw. Now, if the tree is old enough and has been bearing fruit (as poor, small or ‘weasely’ as they may be), sometimes you can identify a wild or neglected apple tree by the fact that there might be fruit on the ground under the tree or some still hanging on the tree (many trees hold onto a few fruit even into the winter, which is great for the birds). Another way is to look for ‘spurs’ (and I’ll show you a photo of those) – apple trees grow sprouts on their branches with a rather ‘knobby’ look – these are spurs which will have flowers and then fruit on them. 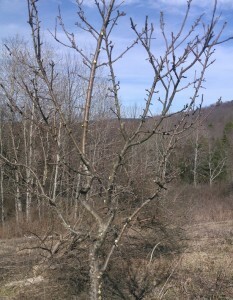 In the photo above, this is a fairly young apple tree. Even from this distance, if you look hard, you can see that the sprouts on the branches look a bit ‘knobbly’. Around the base are a lot of red sprouts – these are, frankly, one of the invasive species here, Multiflora Rose. They are nasty – grow like fury and are almost impossible to eliminate except with an herbicide, which we refuse to use. So, what I did was, using loppers (which basically look like hand pruners put at the end of two long handles), I cut off all the rose sprouts at ground level and below basically so I could clear the area and get to the tree. Weill the roses sprout again? You bet – but the DH will be regularly mowing this area with the tractor and what he doesn’t get with the mower, I will get closer to the tree with something else and that will keep the roses at bey. Small digression: Remember the story of Sleeping Beauty and how her rescuer had to cut through spiny vines to get to her castle? At this point, given that the DH and I have had to use a brush-cutter with a 15″ blade to get through some of these rose bushes because the trunks were at least 1″ thick, I’m convinced that what had taken over to keep out intruders was multiflora rose. OK, back to the tree. 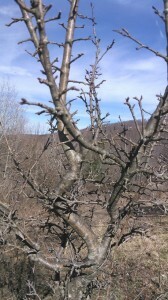 When you want to rescue an apple tree, you need to take a good hard look at it for shape and size and what is going on, especially in the center of the branches, where they come together. 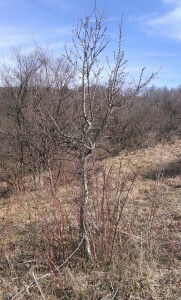 Now, this is a fairly young tree, growing in an open pasture. So, it’s had plenty of air and space and isn’t ‘feeling’ crowded. But at the same time, as you can see from this photo, there are all sorts of sprouts and branches growing either in the direction of the center or are already IN the center. You can also see the ‘knobbly’ nature of them. There are many different type of pruning that can be done here, but one of the most popular is called ‘vase’ or ‘wine glass’, meaning (and more meaningfully) ‘open up the center’. With this tree, we’ve got sprouts growing into the center and up and also a couple of small branches growing in the direction of the center. I have to get these out. Another issue to take care of is to eliminate any branches which are crossing over one another, even if they are not touching one another right now. Why? Well, as this tree grows, the branches are going to get bigger and bigger and then they WILL touch one another. And with wind, and a load of apples at the end of the branches (and you’d be amazed at how much a branch-full of apples weighs and how much it will bow down a branch), they will rub against one another, rub away the bark and allow insects and infection to set in. You’ll end up having to take off at least one of those branches when that happens because it is weakened, so you may as well do it NOW. 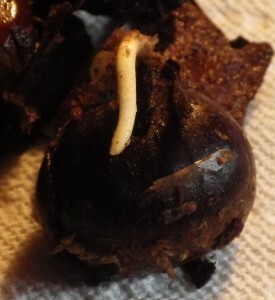 Any new sprout that results can be trained away (think Bonsai, seriously) or down or in some other direction. Another thing to look at is the trunk itself. 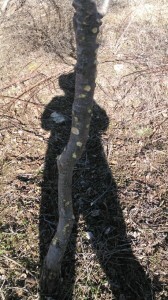 As you can see from this picture, I’ve removed (using a pruning saw – these are very effective and useful items to have – they fold up and can be carried in a pocket and make fast work of branches and sprouts) all the little sprouts that are below the main crotch of the tree with the branches come in. Why? Well, if I don’t, they will just keep growing into something larger and they are not where I want branches. So, off they go. So, we’ve taken off the sprouts all around the trunk and have opened up the center, taking out any branches and sprouts which are growing there, plus any sprouts on branches that are growing TOWARD the center. This opens up the center. Now, there are other things that I can do to the tree, but not this year. Not now. Why? Well, Even with a young tree like this, doing this much work on the tree is going to encourage it to sprout. 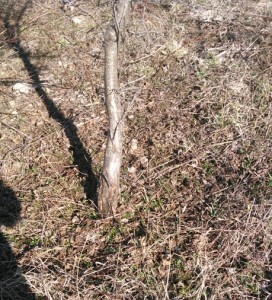 With an old neglected tree – and we have plenty of those as well – we will examine the tree for old dead branches. Those will be taken off as close to the trunk and the center as possible to encourage the tree to grow something solid and good there. In general, when you find a neglected or wild tree, you should only do about 1/3 of the work that you would need to do to ideally put it into shape. For example with this tree, I did not do any work on the top to cut it back – that would have been too harsh and a real shock to the tree – I would have ended up this year with literally a ‘witch’s broom’ full of sprouts up there if I had. Another thing I can do and that I will start to do this fall, is start to train the main branches slowly down so that they are more horizontal. The more horizontal the branches are, the sooner the tree will go into fruiting stages. But, again, I would not want to just bring out stakes and rope and pull down the branches to a horizontal position – again, much too harsh. This fall, I’ll bring out rope and bring them about 1/3 of the way down and leave that for a year. Then next year, I’ll bring them down a little bit more and so on until they are closer to horizontal (see, I told you it would be like Bonsai). Not that the tree might now flower and produce fruit without me doing that, but the closer to horizontal the branches are, the more fruit will be produced This is the basis of ‘espalier’ (trained on a wall) fruit tree growing. When I was done yesterday, I had one more job to do, and that is identifying the tree in some way so that someone later on will not just cut it down without thinking. This property, theoretically, is going to stay in the family for generations and my grandchildren’s grandchildren might not be familiar. 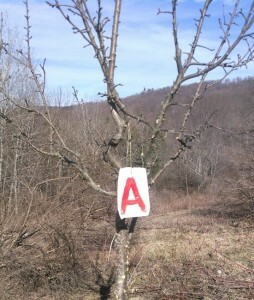 So, every apple tree we find, we put an identification tag on it. Now, this paint has not proven to be weather-proof; we’ll have to find something else, but at least we know for the present that this is …well, I think you can guess. 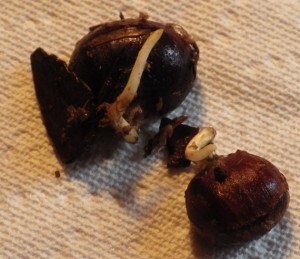 Mystery photos of the week: Anyone know what seeds these are? A hint: the larger one is about the size of my thumb-nail.